서명/저자 Public jobs and political agendas : the public sector in an era of economic stress / ed. by Daniel J.B. Mitchell. Labor and employment relations association. In many ways the public sector and the private sector share concerns about how best to manage their employment functions: recruitment, evaluation, incentives, discipline, retention, compensation. There are also substantial differences between the two sectors. Not surprisingly, a period such as the Great Recession and its aftermath highlights those differences. Some state and local governments that had engaged in precarious fiscal practices were thrust into public attention as their tax revenues receded. But that is not the whole story. The reasons public sector workers and human resource practices are under scrutiny go beyond the impact of a recession putting the spotlight on already-strained budgets. 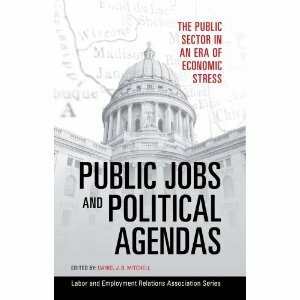 Public Jobs and Political Agendas spotlights the important public/private differences that account for the special attention visited upon the public sector starting with the Great Recession. The first of these differences was the timing of the response to the recession and its aftermath on revenues. The second difference involves employee compensation and the contrasts between public and private practices in that area. Intertwined with these two factors is the role of politics: social welfare programs have been targeted in recent years, with repercussions for even the most efficient state and local government agencies and their employees.